Are you experiencing a severe, throbbing or uncomfortable pain in your jaw? It may come out of the blue or even start as a slight feeble ache and increase in intensity over time. Jaw pain can be so bad that it affects your ability to eat or speak! However, jaw pain may not always be connected to problems with your jaw. The underlying cause can vary from trouble with your sinuses to your teeth. One of the main causes of jaw pain is temporomandibular disorder (TMD). TMD can occur due to a jaw joint injury, excess stimulation of the jaws, soreness of the muscles controlling jaw movements, shifting of the disc that cushions the jaw movements, or arthritis in the disc that shields the jaw joint. 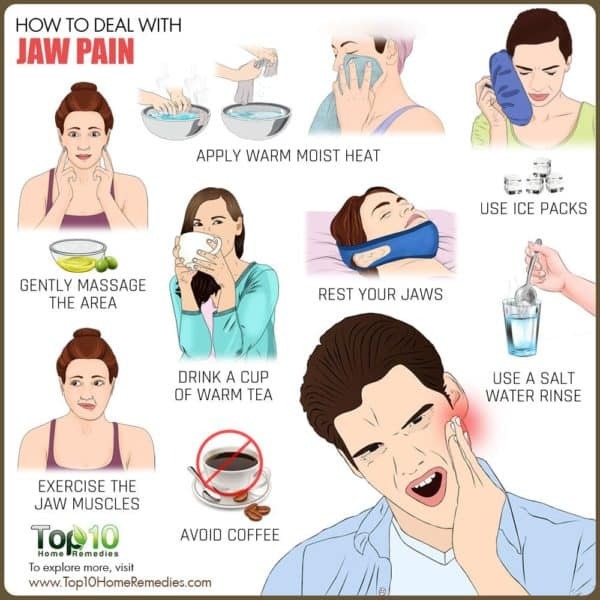 Other causes of jaw pain include cluster headaches, sinus problems, dental conditions, trigeminal neuralgia, a heart attack, osteomyelitis, teeth grinding and so on. Depending upon the cause, the symptoms can vary. Some common symptoms associated with jaw pain are a popping sensation, tooth pain, difficulty chewing, soreness, a dull pain in other parts of the face or neck, frequent headaches, pain that extends from within and around your ears, rigidity of the jaw that makes it difficult to open the mouth and tension in the jaw. Before you start treating your jaw pain, it is important to find out the cause of the problem. In the meantime, you can try some home remedies and simple lifestyle changes to reduce the pain and soreness. 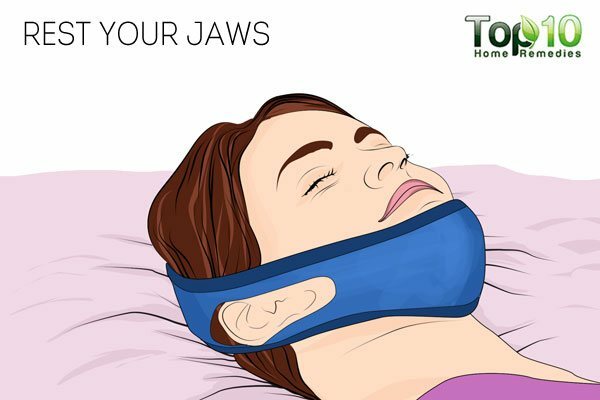 Here are the top 10 ways to relieve jaw pain. If you are experiencing jaw pain that’s unbearable, ice therapy is a very effective treatment. 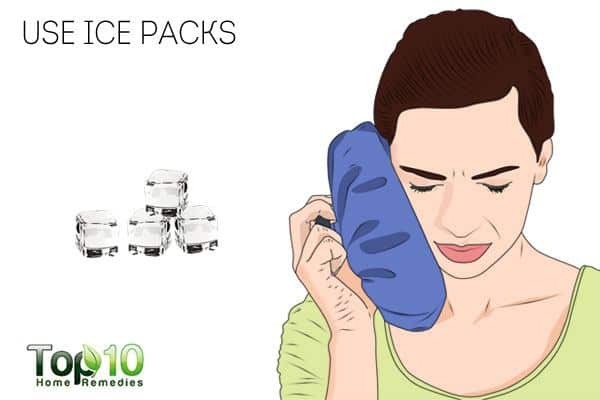 It can be uncomfortable to hold an ice pack for very long against your jaw, but the instant relief that you get makes this remedy worth trying. Applying a cold pack on the jaw helps relieve muscle pain and other symptoms. The cold temperature has a numbing effect on the nerves, which plays a key role in reducing the pain and soreness. 1. Put ice into a plastic bag. 2. Wrap it in a thin cloth. 3. 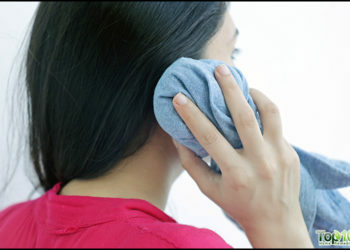 Apply the ice pack to the affected area for 10 minutes. 4. Take a break for 10 minutes before reapplying the ice pack. Caution: Do not apply ice directly on your skin, as it can pose a risk of frostbite. Applying warm, moist heat to the side of your face may also help alleviate jaw pain. The moist heat helps relax the overactive jaw muscles, which in turn reduces pain. Warm, moist heat also improves blood circulation to the affected area, which aids the healing process. 1. Soak a cloth in warm water and wring out the excess water. 2. 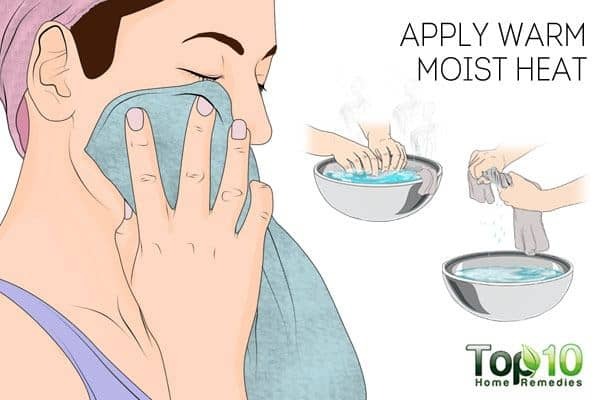 Apply the warm, moist cloth to your face for 5 to 15 minutes. 3. Repeat every 2 hours until the pain is gone. Note: Before applying the warm compress, check the temperature on your hand to avoid burning your face. You can also massage the affected area to get relief from jaw pain. It can help address the underlying discomforts of jaw pain, no matter what the cause. Massage helps relieve muscle tightness and enhances blood flow to the area. It even helps provide relief from arthritis pain. A 2007 study published in the Journal of Bodywork and Movement Therapies suggests that western massage and strain-counterstrain techniques can improve the jaw’s range of motion, alleviate the intensity and reduce the frequency of pain related to temporomandibular joint syndrome without surgical or pharmacological intervention. 1. 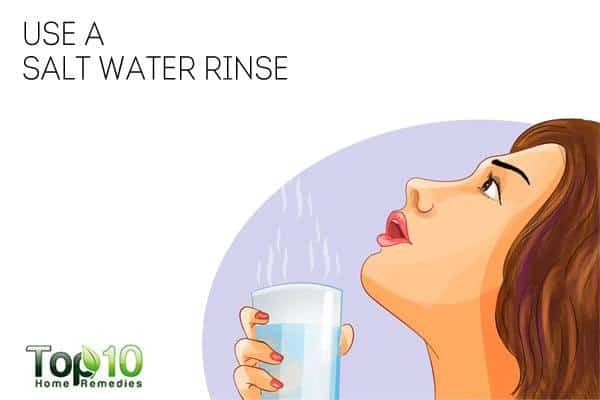 Apply some warm coconut or olive oil on your jawline. 2. Massage the area using your index and middle fingers, making circular motions for 5 minutes. 3. Take a break and try to open and close your mouth 4 or 5 times. 4. Repeat this process a few times. You can also massage your neck to relieve tension in the muscles around your jawline. Gently stretching and exercising the jaw area can help keep jaw pain from returning. It helps relax the tense muscles, which helps reduce the pain. One way to stretch the jaw involves pressing the tip of your tongue against the roof of your mouth, then slowly opening your mouth as wide as you can without it becoming painful. If you feel pain, stop performing the exercise. It may just need more time before you can further engage the muscles and jaw area. 1. Keep your mouth closed and your jaw as relaxed as possible. 2. With your teeth slightly apart, slowly open your mouth as wide as you can. 3. Hold your mouth open for a few seconds, then slowly close it. 4. Once your mouth is closed, move your jaw to the left side while looking to your right with your eyes. 5. Hold this position for a few seconds, then move back to the center. 6. Repeat the stretch, moving your jaw to the right side while looking to your left. 7. Do the whole cycle 2 or 3 times. When you are tense or under stress and are likely to grind your teeth, drink a cup of warm tea. Warm herbal tea will have a relaxing effect on your body. When you are relaxed and calm, there is less chance that you will grind your teeth, one of the key reasons behind jaw pain. Also, a warm cup of herbal tea relaxes the facial muscles. You can try green tea or chamomile tea, due to their anti-inflammatory properties. 1. Mix 2 teaspoons of dried chamomile flowers or green tea leaves in a cup of hot water. 2. Cover and let it steep for 5 minutes. 3. Strain and add some lemon juice and honey. 4. Drink this tea 2 or 3 times a day. Acupuncture that applies pressure on acupressure points can also be used to treat jaw pain. The acupressure points lie along meridians in your body. A 2010 study published in the Journal of Acupuncture and Meridian Studies reports that acupuncture treatment was a safe and efficient method for relieving the pain of patients suffering from TMD with no detectable osseous joint component. 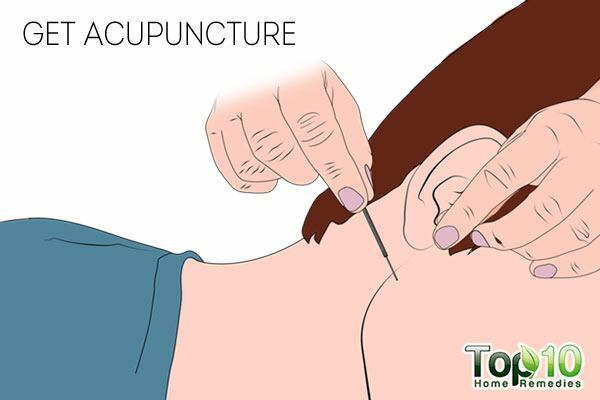 Earlier, a 2009 study published in the Journal of Orofacial Pain reported that a single acupuncture session using one acupoint at Hegu large intestine 4 significantly reduced most myofascial jaw, neck and headache pain. Pressing and massaging this point for a couple of minutes can help a lot. However, if you are new to acupressure, see a specialist trained in acupuncture or acupressure, who are experts in treating chronic pain by apply the right amount of pressure at specific locations on your body. 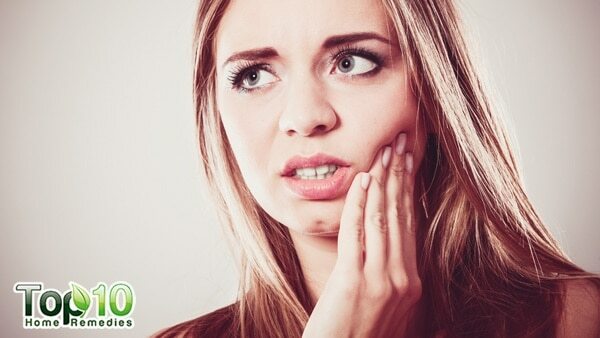 To help manage jaw pain associated with an abscessed tooth, salt water is very effective. Salt has antiseptic and antibacterial properties that can help reduce inflammation and ease pain. It also helps draw out any infection and prevent the growth of bacteria in the mouth, thus preventing further jaw pain. 1. Add 1 teaspoon of salt to a glass of lukewarm water. 2. Mix it until the salt dissolves completely. 3. Rinse your mouth with this solution. 4. Do this 2 or 3 times a day to reduce pain and other discomforts. You can rest your jaws and ease the pain by avoiding foods that require a lot of chewing or are quite tough or crunchy. Some examples are apples, chewy meat, chewing gum, sugar cane and roasted cobs. Avoiding these foods will spare your jaws from overworking, particularly when the pain is severe. You can try soups, pastas and other easy-to-eat foods that do not require too much chewing. At the same time, avoid taking big bites. Cut your food into smaller portions, so you don’t have to overwork your jaw. Many people unconsciously respond to stress by grinding their teeth or clenching their jaw. If you are under stress and have jaw pain, you can ease the pain by taking steps to reduce your stress. A good first step to managing stress is finding out what calms you down. For some, it can be listening to relaxing music or taking a calming, warm bath. 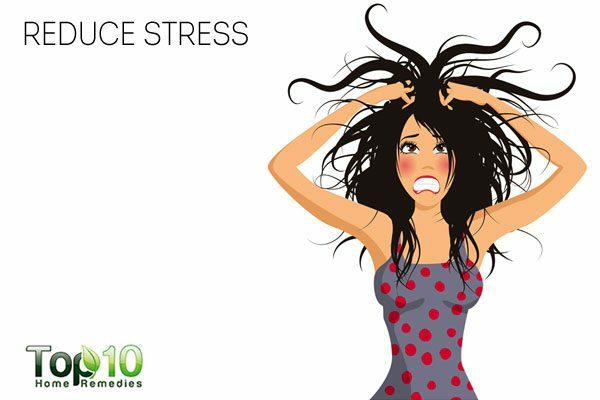 Yoga, meditation and a vigorous workout can also help reduce stress. Practice your stress-relieving activity every day, especially before going to bed to prevent grinding your teeth while you’re sleeping. When suffering from jaw pain, avoid drinking coffee. The caffeine in coffee increases the tension in your muscles. This in turn increases the pain. Cutting back or eliminating coffee will help the healing process. 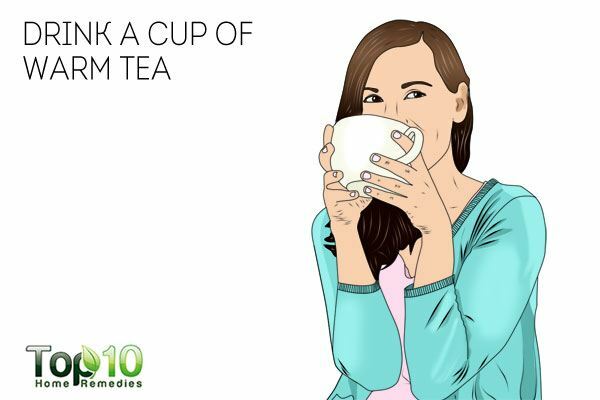 You must also try to avoid drinking tea that contains a good amount of caffeine. Switch to decaffeinated drinks. 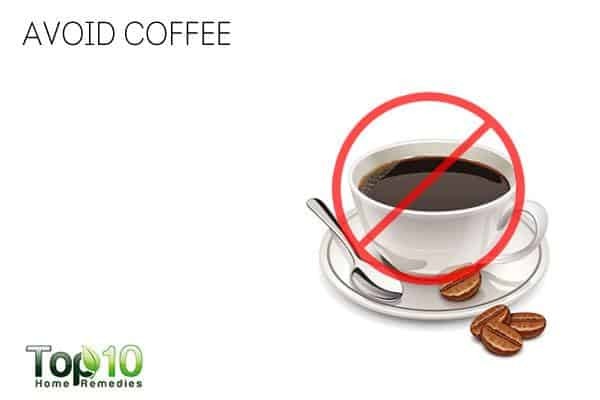 Along with caffeinated drinks, avoid other stimulants like tobacco and alcohol. In fact, drinking alcoholic drinks in the evening can affect your sleep, which in turn can raise your stress level. • You can also try many over-the-counter pain relievers to ease the pain. • If you still suffer from pain, you can consult your dentist, who may suggest wearing a mouth guard, taking muscle relaxers or even Botox injections. Depending on the cause, jaw surgery may be a last resort option. • Maintain a good posture, especially while sitting for long hours. • If you spend a lot of time with the phone cradled between your shoulder and cheek, stop this habit. It puts a lot of strain on your neck and jaw. • If nightly teeth grinding or clenching is contributing to jaw pain, try wearing a mouth guard. • If you see someone yawning, resist the temptation to join in. A big, wide yawn is sure to cause pain. • Avoid chewing gum. Every time you chew, you tense your jaw muscles and it will only increase your pain. • Sleep on your back to reduce unnecessary strain on your jawline. • Eat foods rich in omega-3 fatty acids to reduce inflammation. • Consciously do deep breathing to help relax tense muscles, which can reduce pain. • If you frequently rest your chin on your hand, it’s time to stop to reduce neck and facial pain. • If you have the habit of carrying a monstrous purse or briefcase on one shoulder, lighten your load. I was suffering from jaw pain that made chewing almost impossible. At the same time, I was feeling pain in my ribs and and in my right elbow. I am grateful to the Almighty that I started to take magnesium supplements to relieve constipation – and then all the pain disappeared! Thanks for your advice for relieving pain, but, as you emphasised, the wisest advice is to investigate the reason for the pain. You didn’t mention a deficiency in magnesium. I would advise anyone with the above mentioned symptoms to look into it. By the way, it won’t show up in regular blood tests because most of your magnesium is stored in your bones, not in your blood. You have to experiment and see if magnesium supplementation helps.